I survived Cabin Fever. It wasn't even that scary, or even that gruesome. I spent all that time worrying about the way I'd react, and after it was finished I was like "oh is that it?" But I wasn't disappointed... well I was a little. You see I rented the DVD from work, and before I brought it home I'm cleaned it to get rid of the scratches... and it didn't work. And guess what scene was the only scene it jumped at??? the scene with ELI ROTH in it. I was so disappointed, he was the only reason I watched the movie in the first place and I missed the scene, GAH! I loved the Making Of. Eli is awesome... and his dad's name is SHELDON. tehehe. AWESOME. It was a good movie. I gives it 3 ♥'s. rachkitty gave me an idea. 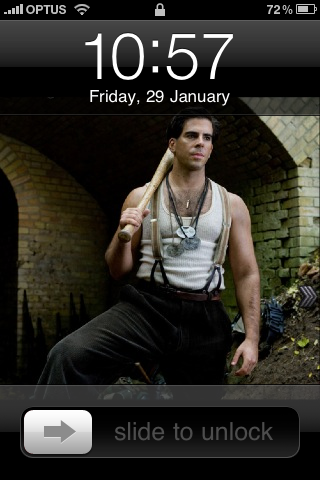 do you want to see what my current iPhone wallpaper is? you don't? well I don't care cos I'm posting it anyway.